1:3 From twenty years old and upward, all that are able to go forth to war in Yisrael (ישׂרא): you and Aharon shall number them by their armies. 1:4 And with you there shall be a man of every tribe; every one head of the beit of his Avot. of the tribe of Reuven; Elitzur Ben Shedeur. 1:6 Of Shim'on; Shelumiel Ben Tzuri Shaddai. 1:7 Of Yehudah; Nachshon Ben AmminAdav. 1:8 Of Yissakhar; Netanel Ben Tzuar. 1:9 Of Zevulun; Eliav Ben Helon. of Menasheh; Gamli'el Ben Pedahtzur. 1:11 Of BenYamin; Avidan Ben Gideoni. 1:12 Of Dan; Achiezer Ben Ammi Shaddai. 1:13 Of Asher; Pagiel Ben Ochran. 1:14 Of Gad; Elyasaf Ben Deuel. 1:15 Of Naftali; Achira Ben Enan. 1:16 These [were] the renowned of the congregation, princes of the tribes of their Avot, heads of thousands in Yisrael (ישׂרא). 1:18 And they assembled all the congregation together on the first [day] of the second month, and they declared their pedigrees after their mishpekhot (families), by the beit of their Avot, according to the number of the shemot, from twenty years old and upward, by their polls (gulgelotam). 1:19 As ADONAI (יהוה) commanded Moshe, so he numbered them in the wilderness of Sinai. 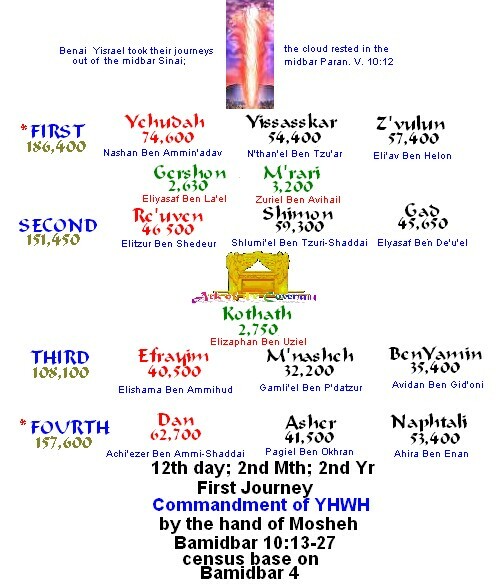 1:44 These [are] those that were numbered, which Moshe and Aharon numbered, and the princes of Yisrael (ישׂרא), [being] twelve men: each one was for the beit of his Avot. 1:47 But the Leviim after the tribe of their Avot were not numbered among them. 1:50 But you shall appoint the Leviim over the Mishkan HaEdut (testimony), and over all the vessels thereof, and over all things that [belong] to it: they shall bear the Mishkan , and all the vessels thereof; and they shall minister to it, and shall encamp round about the Mishkan . 1:51 And when the Mishkan sets forward, the Leviim shall take it down: and when the Mishkan is to be pitched, the Leviim shall set it up: and the stranger that comes nigh shall be put to death. 1:52 And the Benai Yisrael (ישׂרא) shall pitch their tents, every man by his own camp, and every man by his own degel (standard), throughout their Tzavot. 1:53 But the Leviim shall pitch round about the Mishkan HaEdut (testimony), that there be no wrath upon the congregation of the Benai Yisrael (ישׂרא): and the Leviim shall keep the charge of the Mishkan HaEdut (testimony). 1:54 And the Benai Yisrael (ישׂרא) did according to all that ADONAI (יהוה) commanded Moshe, so did they. The geography setting of Bamidbar is the wilderness. This setting serves as a powerful spiritual metaphor. As a nation were spiritually traveling through a wasteland. They had to endure physical hardships and other experiences that tested their faith. Shemot constituted the birth of nation of Yisrael. 1:47-54 The Leviim were not numbered among the men of Yisrael who were to be warriors (v. 47). They were charged with the setting up and taking down of the tabernacle and with the ministry connected with it. By positioning themselves around the tabernacle, they protected it from desecration and thus protected the people from punishment (v. 53).